4 Average fuel consumption meter Displays the average fuel consumption since the function was reset. 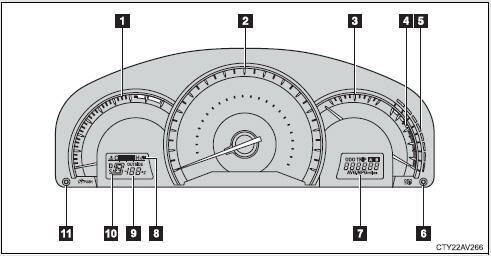 Displays the engine coolant temperature and instrument panel light control. 7 Odometer/trip meter/outside temperature/average fuel consumption/current fuel consumption display. 8 Shift position/shift range display Displays the currently selected shift position and the shift range. 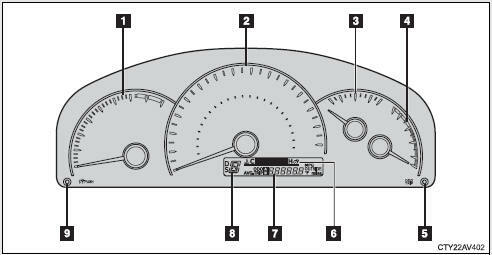 5 Current fuel consumption gauge (if equipped) Displays the current rate of fuel consumption. 7 Odometer/trip meter/average fuel consumption display 8 Engine coolant temperature display/instrument panel light control display Displays the engine coolant temperature and instrument panel light control. 9 Outside temperature display 10 Shift position/shift range display Displays the currently selected shift position and the shift range.